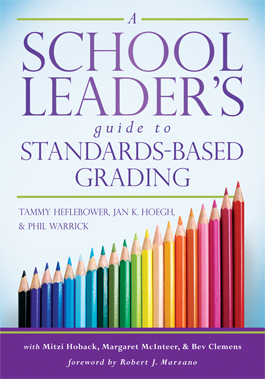 Standards-based grading is a system of assessing and reporting that describes student progress in relation to standards. Standards-based grading is an effective way to give feedback and evaluate students’ performances using clearly defined criteria for specific learning standards. The first step in implementing standards-based grading is to clearly identify and articulate what students need to know and be able to do as a result of schooling. Ensuring the use of quality classroom assessments is an important component of standards-based grading. Teachers can differentiate learning for exceptional learners in a standards-based classroom by making accommodations or modifications to general proficiency scales. When revising general proficiency scales to include accommodations for exceptional learners, teachers can consider how students are asked to demonstrate their understanding, how information is presented to students, where instruction takes place, and the timing of instruction. Modifications to standard proficiency scales alter the expectations for exceptional learners so that learning progressions suit each individual’s base understanding of the content. Prioritized standards clearly articulate which skills and what content each student should master in each grade level. Prioritized standards can be determined using five criteria. A four-step approach can be used by school staff members to streamline the process for selecting standards for prioritization. Accommodations, which are supports that help students achieve grade-level expectations, and modifications, which shift the expectations of a learning target so that it is easier or more difficult, are two ways teachers can personalize learning for exceptional learners. Exceptional learners may include students with disabilities, EL students, and gifted learners. Teachers can first use preassessments to determine which students are already meeting the learning target’s expectations, and thus need additional challenges, and which students are struggling to understand the basic concepts and vocabulary that lead to mastery of the learning target. Results of the preassessments can then be used to inform appropriate accommodations or modifications for a particular exceptional learner (pp. 70–73). An individualized approach to creating accommodations for exceptional learners allows teachers to consider how they can incorporate activities and materials that suit each student’s learning style and background into general proficiency scales. For example, if a student is an English learner, teachers may consider presenting materials in multiple languages or adding illustrations and examples to aid the student’s comprehension. In contrast, when creating accommodations for gifted learners, teachers might design activities that allow students to work independently on their mastery. Any particular accommodations teachers intend to employ can be noted in revised versions of general proficiency scales as new processes, assessment items, or skills that students will use to demonstrate mastery (pp. 75¬–77). If teachers are concerned that some learners do not have the requisite background to succeed at grade-level learning targets, they can modify proficiency scales to outline less complex standards or require students to master less content. Modifications are typically documented and described in an individualized education plan (IEP). When teachers modify the content of a scale, the grading progression is also modified to match the new set of expectations. Descriptors and example assessment activities that once encompassed a 2.0 score, for example, may partially make up the 3.0 score for a modified scale. Additionally, gifted learners who exceed grade-level expectations may also need modified assessment items and descriptors at the higher end of the scale. Modified scales for gifted learners should increase the rigor and complexity for these students so that they can extend their thinking over the course of a unit (pp. 80–82). Prioritized standards are learning goals that have been identified as most essential to a particular grade level, content area, or course. Ideally, teachers at the school or district level collaborate to determine which standards to prioritize. These standards should contain procedural knowledge, which includes skills, strategies, and processes, as well as declarative knowledge, which is fact-based, informational knowledge. Research shows that the more specific these prioritized standards are, the more effective they are at influencing student performance (pp. 16–17). By using these criteria, schools can identify essential knowledge and content that every student should learn (p. 18). School leaders should create a team of staff members from each grade and content area to determine the school’s or district’s prioritized standards. If possible, it is best to determine prioritized standards for any one content area in a contiguous session. Within these meetings, team members can use a basic four-step approach for prioritizing standards. These steps include (1) analyzing current state standards documents to identify important content, (2) selecting preliminary prioritized standards and writing them on sticky notes, (3) categorizing the prioritized standards by strand and theme, and (4) reviewing the final categories for gaps or missing knowledge and skills. Keep in mind that this four-step process serves only as a basic procedure. Thus, school leaders should take care to tailor the process to fit the needs of their staff and their specific school and district (pp. 20–21).